Located in Barceloneta, W Barcelona is adjacent to Barceloneta Beach and within a mile (2 km) of other popular sights like Port Vell. This 473-room, 5-star hotel welcomes business and leisure travelers with 2 outdoor pools, a full-service spa, and 2 restaurants. Enjoy dining at the hotel's 2 on-site restaurants: Wave specialises in Mediterranean cuisine and serves breakfast, lunch and dinner; Salt offers relaxing ocean views. Order from 24-hour room service to satisfy your hunger without leaving your room. Start each morning with buffet breakfast, available for a fee from 7 AM to 11 AM. A flat-screen TV comes with cable channels, and guests can stay connected with free WiFi. Beds sport down comforters and the bathroom offers a rainfall showerhead, a hairdryer, and free toiletries. Other standard amenities include an iPod dock, a minibar and a coffee maker. 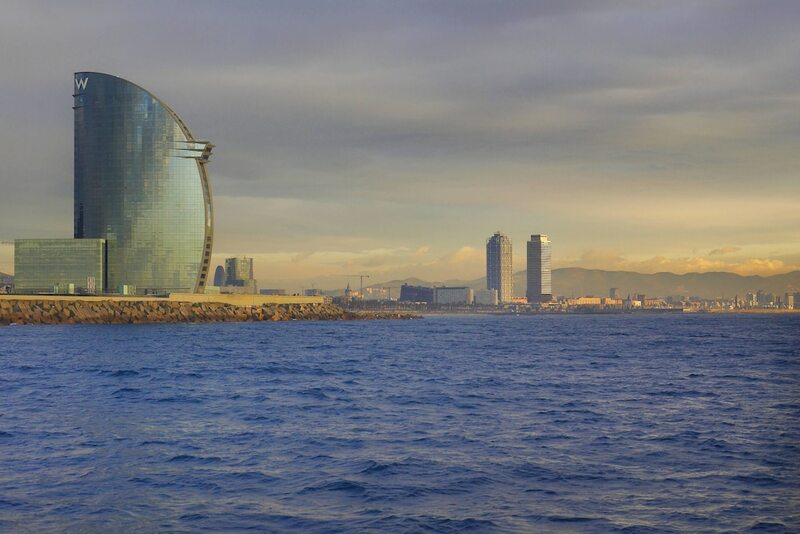 Guests of W Barcelona have access to a full-service spa, 2 outdoor pools, and a nightclub. Valet parking is available for EUR 28.00 per day, and there's also a train station shuttle. Multilingual staff at the 24-hour front desk can assist with luggage storage, dry cleaning/laundry, and tours or tickets. Other amenities at this beach hotel include an indoor pool, a fitness centre, and a sauna. Enjoy the umbrellas and sunloungers for a relaxing day at the beach. At W Barcelona, you can cool off in one of the 2 the outdoor swimming pools and indulge in a pampering afternoon at the full-service spa. Dining is available at one of the hotel's 2 restaurants. A poolside bar is on site where guests can unwind with a drink. Public areas are equipped with complimentary wireless Internet access. This luxury hotel also offers a steam room, a fitness centre and a terrace. On-site parking is available (surcharge), along with a car charging station. W Barcelona is a smoke-free property. Wave – This beachfront restaurant specialises in Mediterranean cuisine and serves breakfast, lunch and dinner. Open daily. Salt – This beachfront restaurant specialises in Californian cuisine and serves lunch and dinner. Guests can enjoy drinks at the bar. Open daily. W Lounge – This bar overlooks the pool. Open daily. Eclipse – This cocktail bar overlooks the ocean. Open daily. 2 the outdoor swimming pools are on site along with an indoor pool. Other recreational amenities include a sauna and a fitness centre. Guests can indulge in a pampering treatment at the hotel's full-service spa, Bliss Spa. Services include deep-tissue massages, sports massages, Swedish massages and facials. A variety of treatment therapies are provided, including hydrotherapy and reflexology. The spa is equipped with a sauna and a steam room. Rollaway/extra beds are available for EUR 110.0 per night. Pets are allowed for an extra charge of EUR 25 per pet, per day. Special cancellation policies or charges may apply for group reservations (more than 8 rooms for the same property/stay dates). Please note that cultural norms and guest policies may differ by country and by property. The policies listed are provided by the property. Guests travelling with pets are charged a EUR 100 cleaning fee per stay, in addition to the daily pet fee. For more details, please contact the property using the number provided on the booking confirmation email. Additional policies and fees may apply when booking more than 10 people. For more details, please contact the property using the information on the reservation confirmation received after booking. Cash transactions at this property cannot exceed EUR 2500 due to national regulations. For further details, please contact the property using the information in the booking confirmation. This property offers transfers from the train station (surcharges may apply). Guests must contact the property with arrival details 24 hours prior to arrival, using the contact information on the booking confirmation. Reservations are required for massage services and spa treatments. Reservations can be made by contacting the hotel prior to arrival, using the contact information on the booking confirmation. Only registered guests are allowed in the guest rooms. Guests can arrange to bring pets by contacting the property directly, using the contact information on the booking confirmation (surcharges apply and can be found in the Fees section).